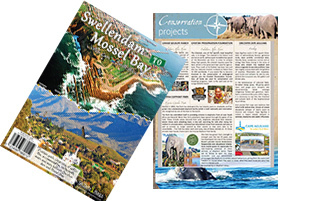 The SA Info Magazine publications are a range of magazines aimed at providing a comprehensive guide to areas across South Africa. The magazines are filled with useful information on the relevant towns and surrounding areas, along with fantastic photos showcasing each Regions uniqueness. There are maps as well as information on activities, accommodation, restaurants and businesses - all the necessary information for tourists to be informed and to enjoy their holiday. The magazines can also be enjoyed as Ezine copies online, as well as in DVD format which includes great photography, advertising and some aerial footage. 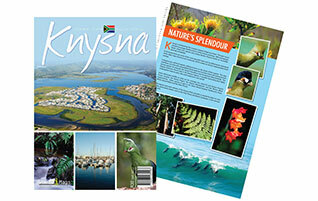 The magazines are sold at various retailers and tourist venues across South Africa, providing not only information but are ideal collector items. Nestled between sea and mountain lies the glorious fun-filled Cape Town. Known as South Africa’s Mother City, Cape Town with its Mediterranean climate, is a popular destination for tourists and South African’s alike. 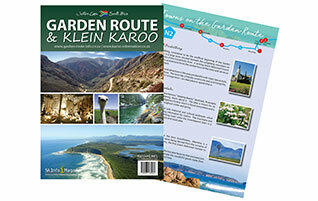 Located just off the N2 highway and the beginning of the Garden Route, is the pretty town of Swellendam. Having celebrated its 250th anniversary in 1995, it is one of the oldest established towns in South Africa (after Cape Town and Stellenbosch), and is surrounded by sheer beauty. The Overberg region of the Cape is located in the southernmost part of South Africa and is one of the six regions in the Western Cape Province. 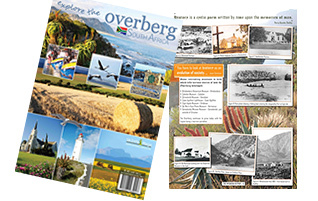 The word Overberg translates into ‘the other side of the mountain’, and was used in earlier days to describe the lands beyond the Hottentots Holland range. Visit the Garden Route and be seduced by the glorious natural beauty of this popular and scenic stretch of the south-eastern coast of South Africa, extending from Mossel Bay to Storms River. 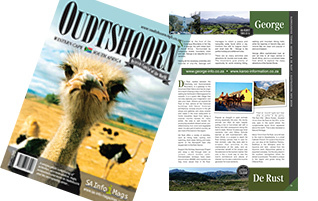 Oudtshoorn, the main hub of the Klein Karoo, is an incredibly popular tourist destination with exceptional contrasts and natural beauty. Known as the ostrich capital of the world, dry summers and sunny winter days. 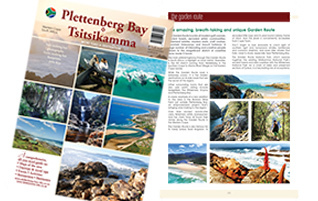 Plettenberg Bay is situated beside the magnificent Indian Ocean and Robberg Penninsula. With intriguing lagoons and estuaries, indigenous forest and unpolluted rivers and sea, Plett has so much to offer.